The garden is in a fairly natural state this summer which seems to suit the pollinators just fine. 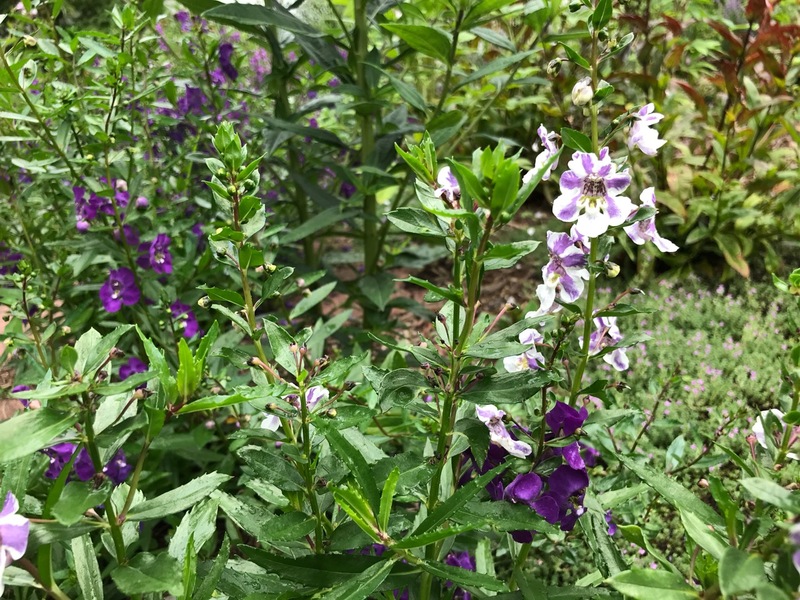 Angelonia (Summer Snapdragon) creates a colorful swath along paths in the meditation circle. 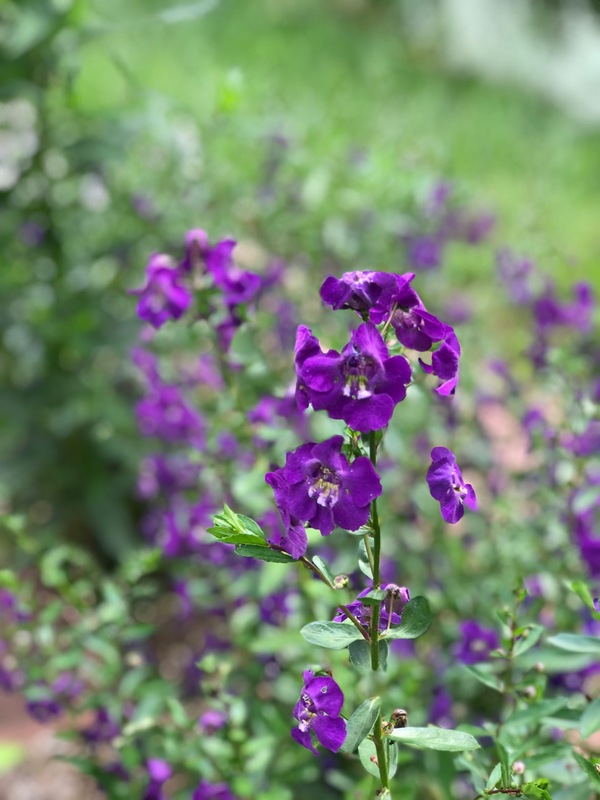 Angelonia in blue, white, purple and bi-color bring vibrancy to the circle as well. 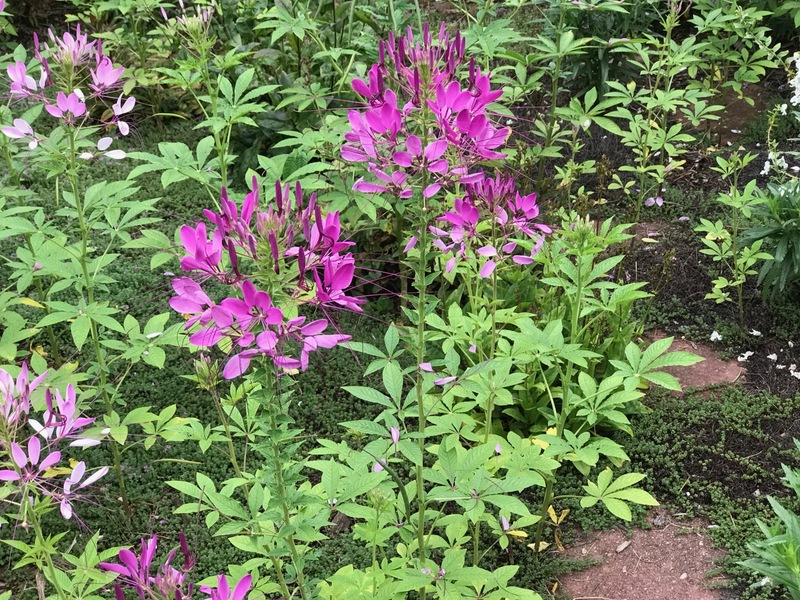 The paths themselves are overgrown with self-seeding Cleome hassleriana (Spider Flower) which I cannot bring myself to pull out. 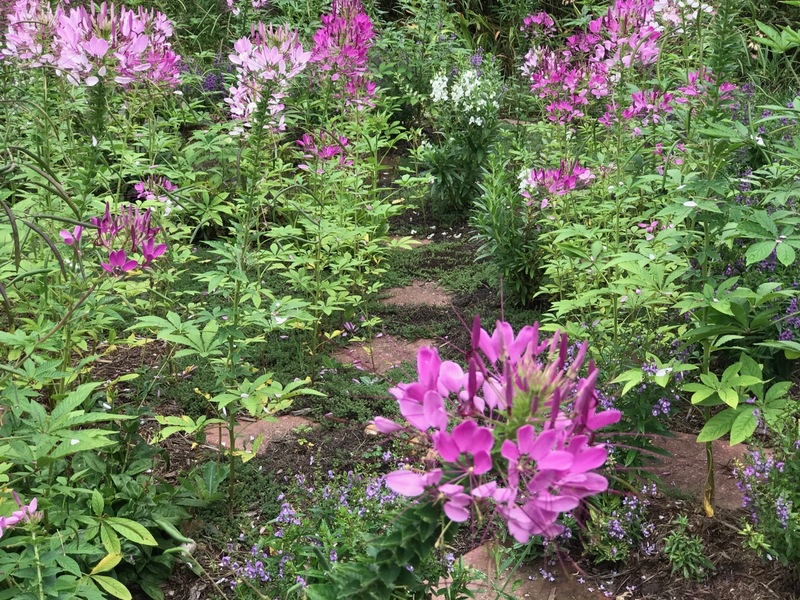 Even though the labyrinth is unwalkable in this condition the overall contribution of the cleome creates an effect in the garden that is magical. 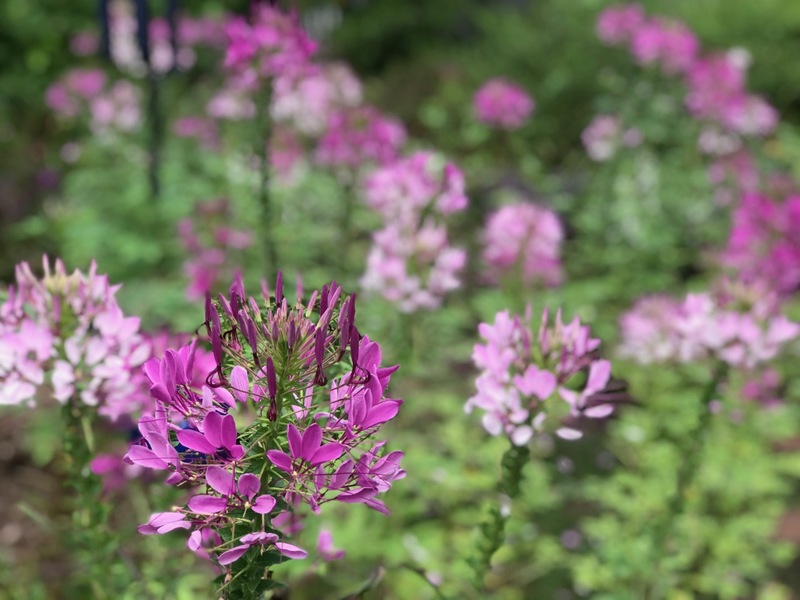 Thymes planted along the paths are in bloom underneath the cleome. Back to the pollinators, these happened not to have been found on the aforementioned plants but quite nearby. 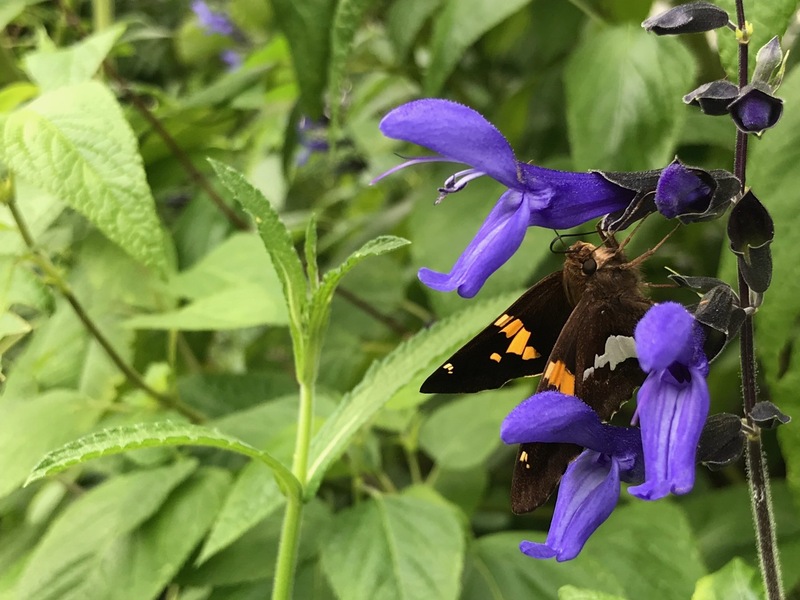 Here is Silver-spotted Skipper (Epargyreus clarus) on Salvia guaranitica ‘Black and Blue’. 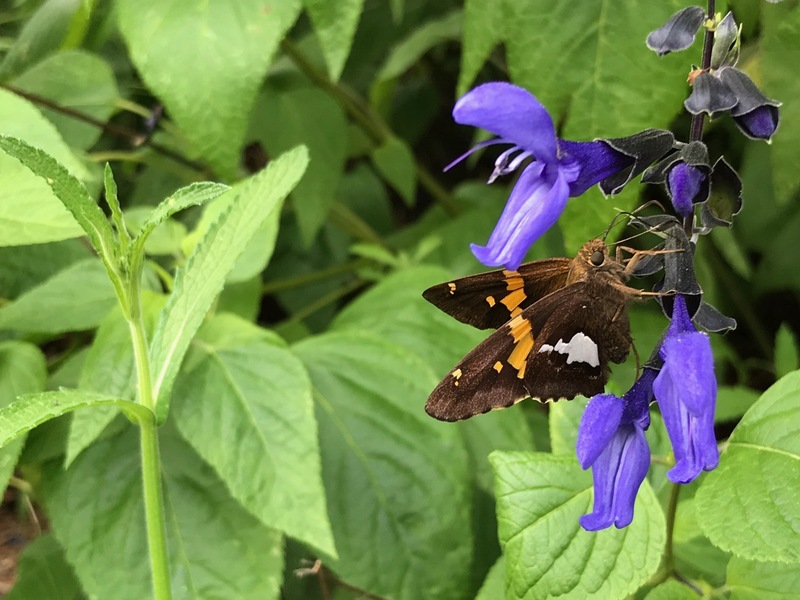 The garden was full of these skippers yesterday. 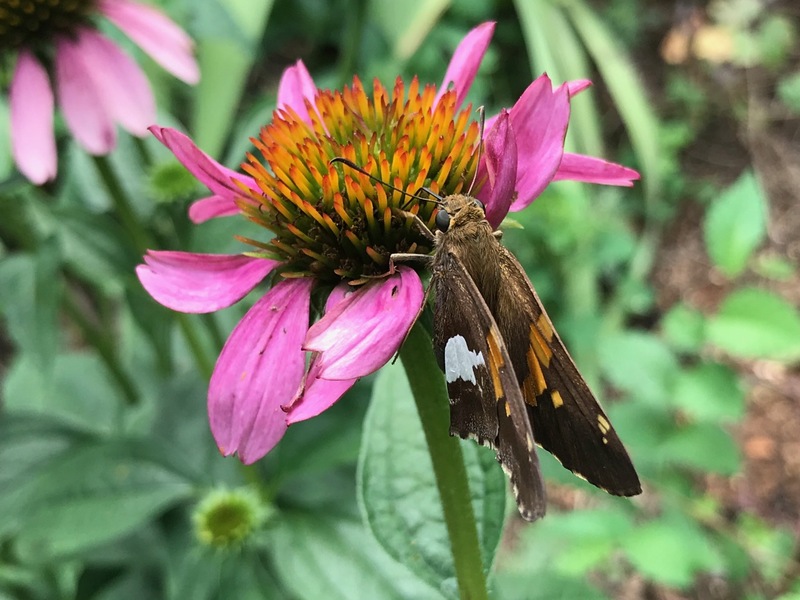 This one is enjoying Echinacea. Hope your gardens are teeming with blooms, activity and life. 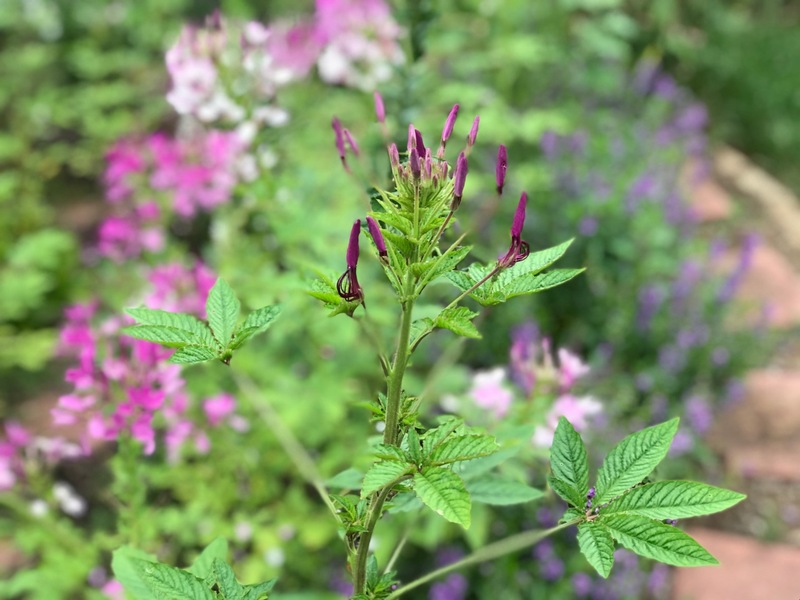 This entry was posted in garden and tagged cleome, Cleome hassleriana (Spider Flower), meditation circle on July 24, 2018 by pbmgarden. I am still looking for beautiful angelonia here, it is so pretty. 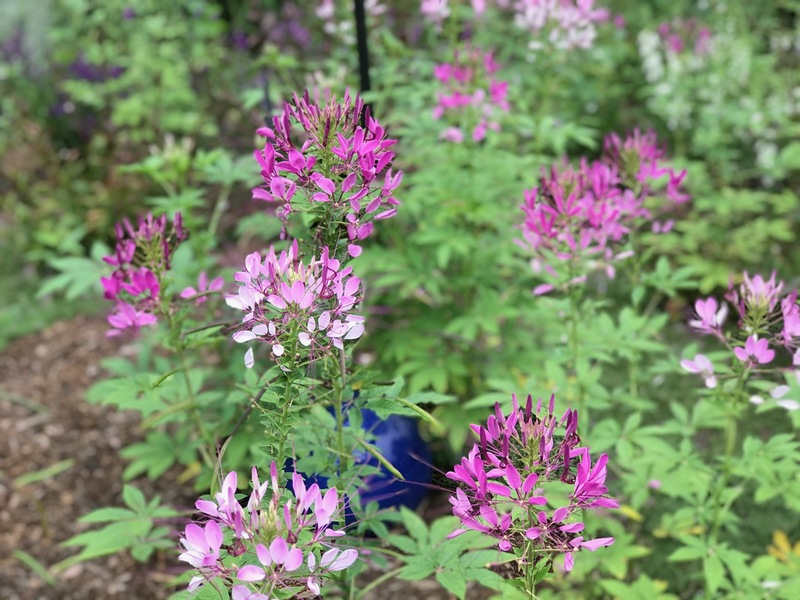 Your self seeded cleome is fabulous. I have never had it self seeding. This year I lost all my seedlings, how wonderful to have swathes of it like this. Gorgeous butterflies too. I do hope you locate a source for Angelonia. Recently a blogger reminded me there is a very fabulous raspberry colored one which I had one year but lately haven’t been able to find. 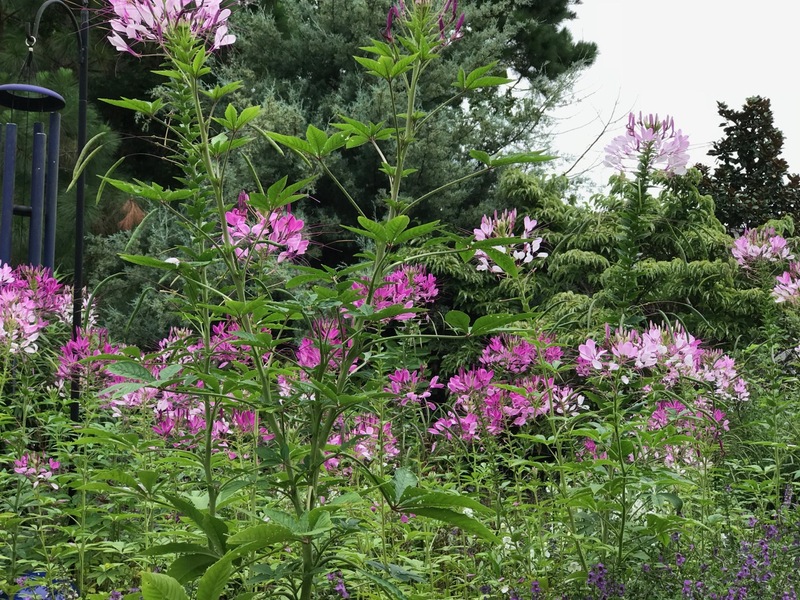 The cleome was never planted inside the meditation circle but one year one showed up and I left it. From there it took off. Interestingly it is dotted throughout other borders but without taking over. I like self-seeders that I can pull out easily (if I had the heart to do so). The photos are absolutely beautiful! Thank you for sharing. Thanks for visiting my little garden today. Glad you enjoyed it. I wouldn’t pull those Cleome seedlings either! I’ve read it’s drought resistant and have been meaning to try some but didn’t plan ahead in planting seeds and then couldn’t find plugs locally when I looked for them. Do the Angelonias over-winter for you? They’re short-lived perennials here – when our summers don’t kill them outright. Cleomes are pretty tough. They may droop in tough afternoon heat and drought, but they bounce back overnight and really perk up with a small bit of water. Angelonias are annuals here. I’ve tried leaving them in place but they don’t survive and don’t reseed. I’m surprised they don’t always make it through your summers, but you have really had some extreme heat. Your garden is looking good. I can’t pull out perfectly fine plants either. It’s hard, isn’t it? 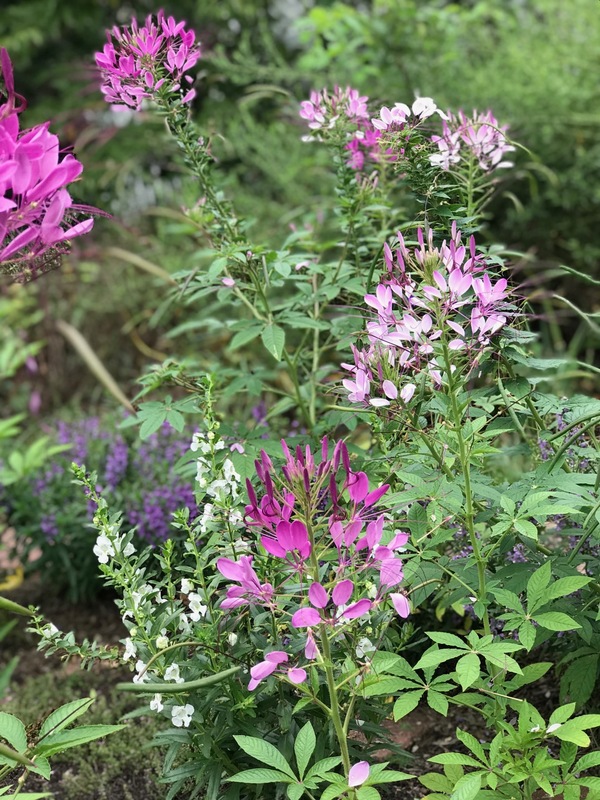 I intended to pull and relocate the cleome, but that didn’t happen so have decided to enjoy their flowers where they planted themselves. Sounds familiar. I am not much of a designer, so it doesn’t bother me. 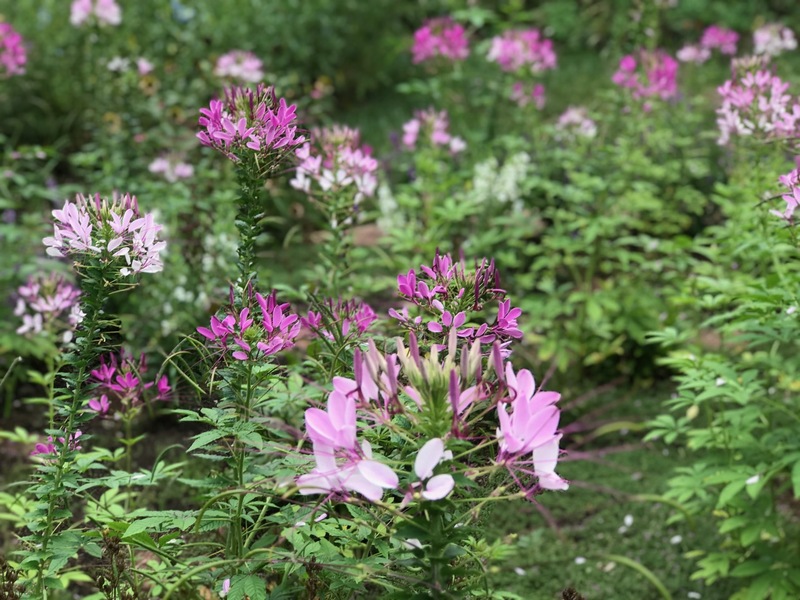 The Cleome look amazing in the path of the meditation circle, I don’t think I would have been able to pull them out either. Thanks. They really do look pretty. 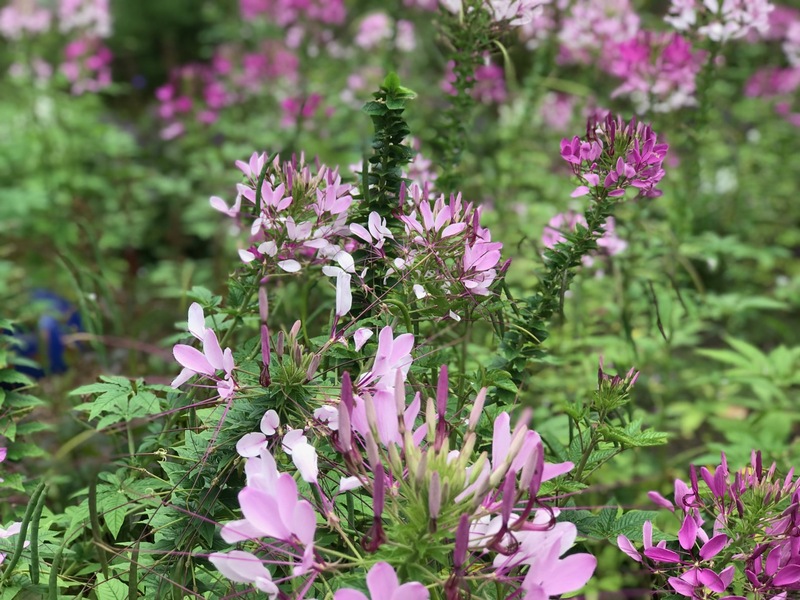 A cloud of pink cleome! Nature sometimes creates a better garden than we can. Here is a perfect example, where one can enjoy the bounty she offers. So true Eliza. It’s pretty awesome. Lovely–your pinks and purples are just gorgeous! 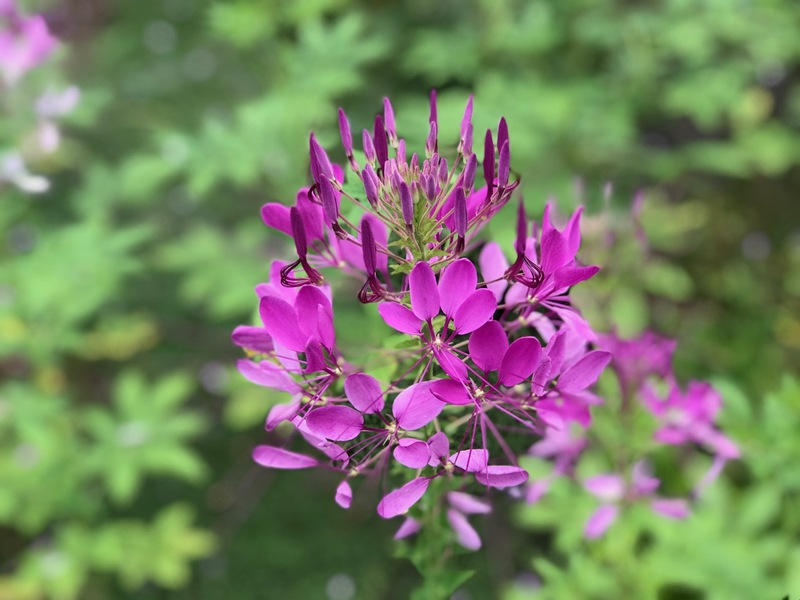 I’ve always liked cleome, but have never grown it. Thanks Tina. 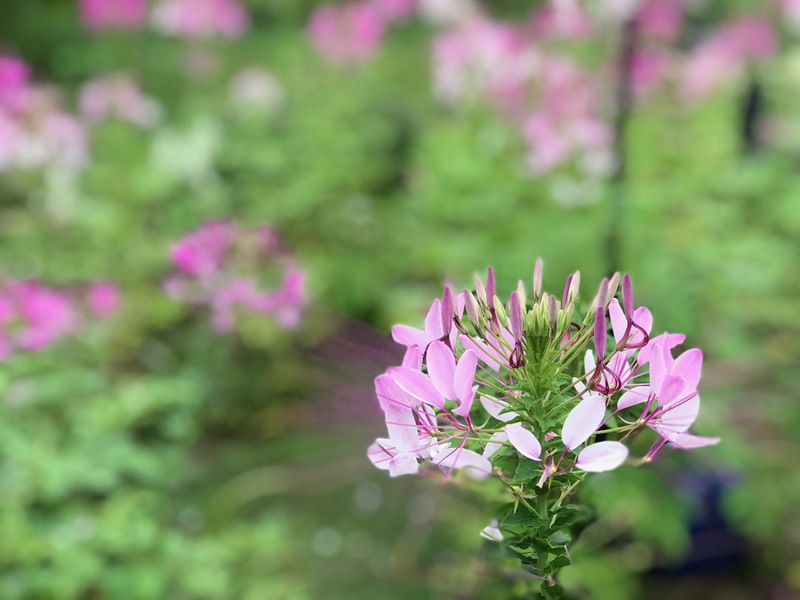 Someone gave me cleome seedlings years ago and I’ve enjoyed having them. Bees love it. 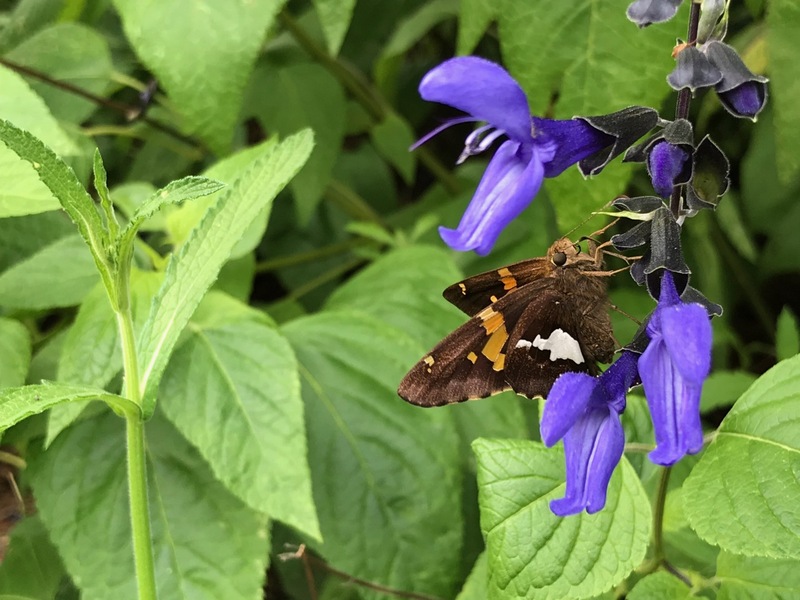 Now that you mention it, I have not seen many, if any, skippers this year. I know they are not common here, but there should be at least some. That’s curious. Hope they show. I love that you just let it do its own thing, it really gives a new look to that part of the garden and I think it’s nice to see such a change even if it’s only for one year. -Plus they’re beautiful! 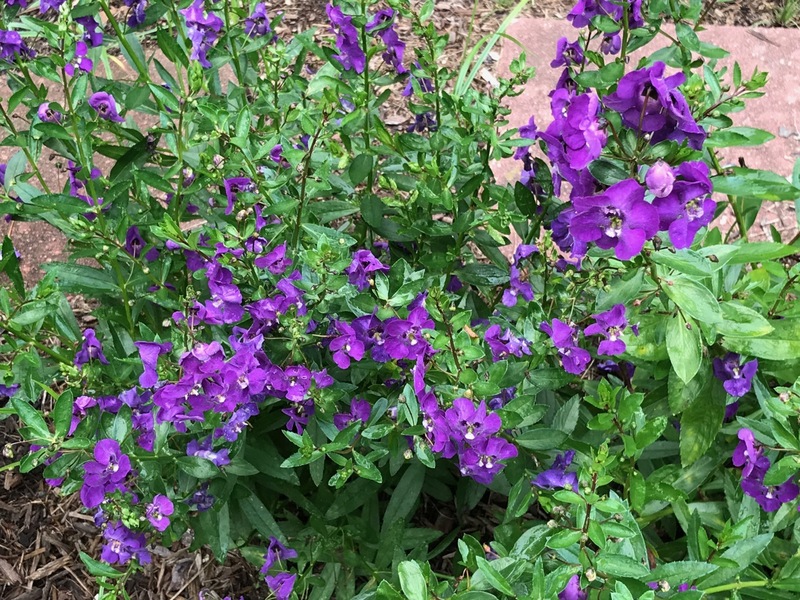 Angelonia do really well for me here in Pa, I always try to add a few to the deck pots since they last all summer. Thanks, it is a refreshing change to experiment with this part of the garden. Thank you for sharing. 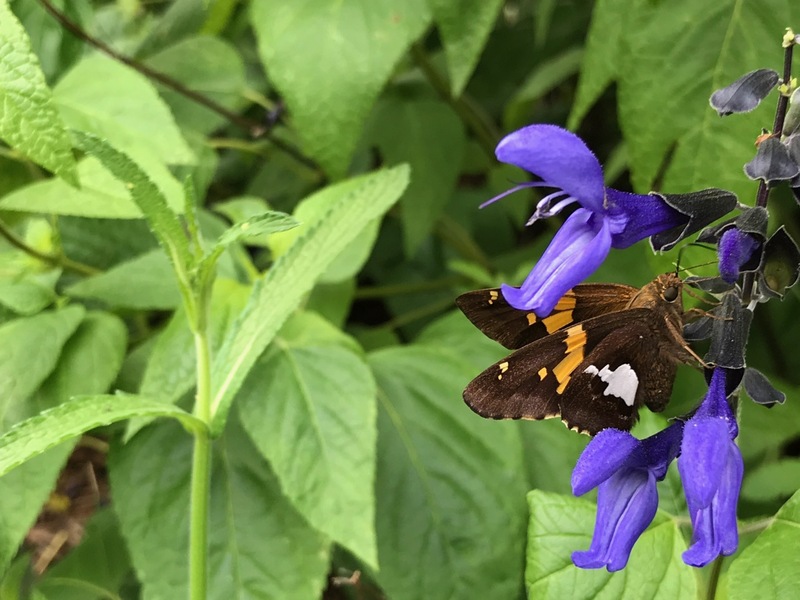 I deeply appreciate the Skipper nectar-ing. 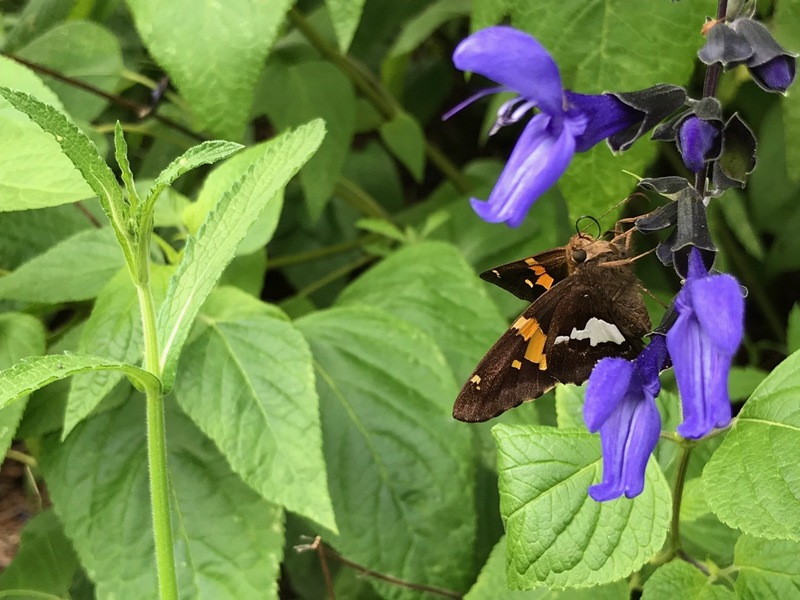 May your winged soul enjoy the nectar of your inner garden. Many blessings on your journey. 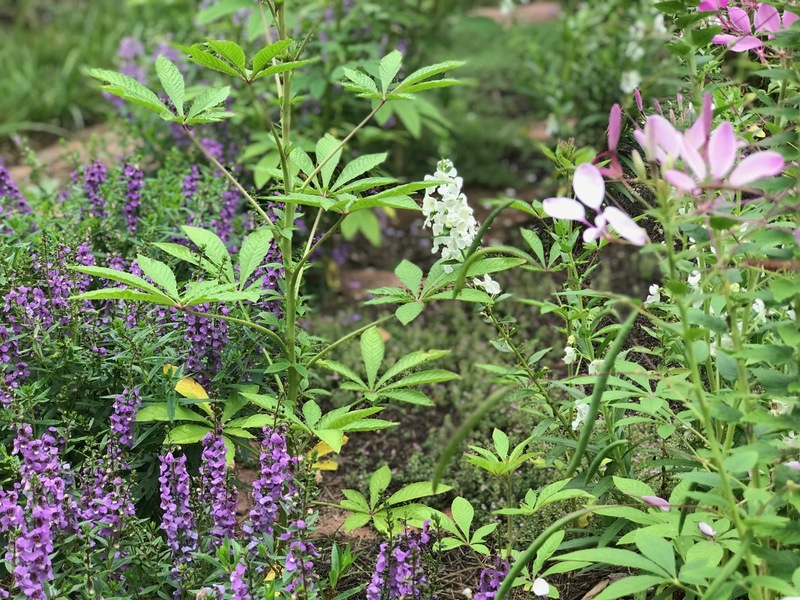 Good to know that the Angelonia and Cleome stand up well to summer weather. 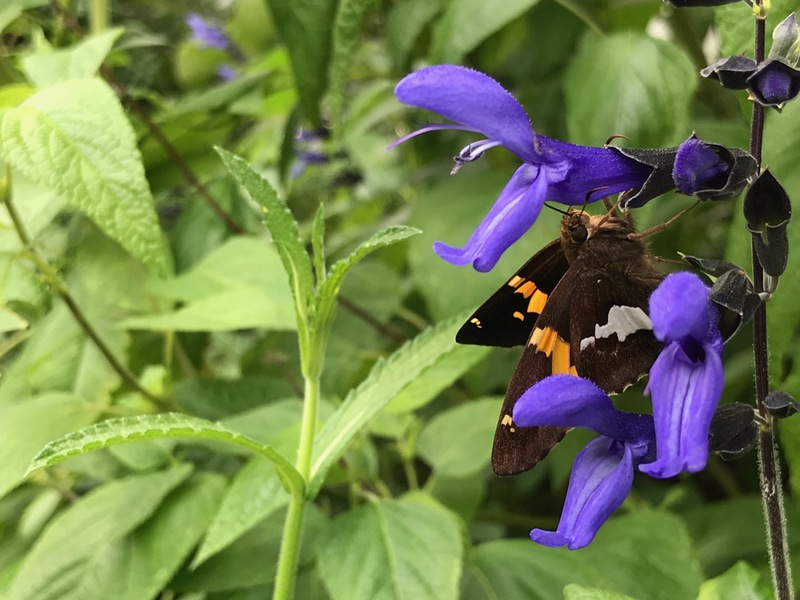 That’s an unusually colorful skipper! Yes they have been stars this summer. 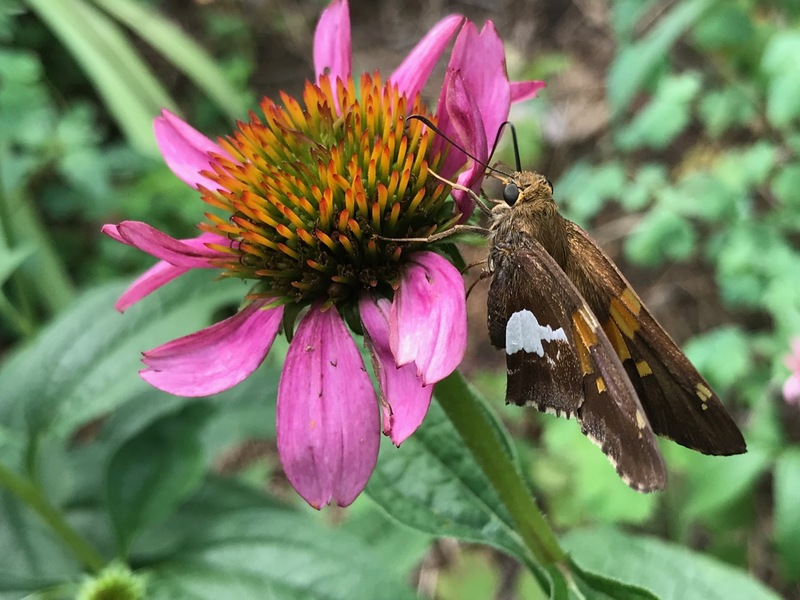 Now that I’ve identified the skipper I am seeing many around the garden. Instead of walking your meditation circle you will have to take your mat and sit in the middle to mediate. A beautiful setting. Mosquitoes are making it treacherous to be amongst any of the plantings for too long, but it is a great thought.